In this section you will find the answers to some of the questions you may have if you have been accused of a road traffic offence. For more information and expert legal advice, call Duncan Lewis motoring offence solicitors on 020 7923 4020, or use our 24/7 emergency hotline on 0207 275 2036. FAQ: The Police pulled me over because they claimed I was speeding but then breathalysed me. I am sure that I wasn’t speeding. Is this lawful? FAQ: Should I have been able to speak to a solicitor when I was at the police station? FAQ: I want to plead not guilty; will I be able to keep driving? FAQ: Can I defend myself? Do I really need representation? FAQ: Will I get a tougher penalty if I try to defend my case but am still found guilty? FAQ: Can I get Legal Aid for my case? FAQ: How many drinks can I have before driving? Officers only need “reasonable suspicion” that a motorist may be over the legal limit in order to require breath sample. If an officer forms the opinion that your driving is erratic or that you are going too fast they can use this to justify a requirement for a breath sample and subsequent arrest. Access to free legal advice is one of your basic legal rights whilst in police custody. When you arrive into the custody area, the offer of a solicitor/legal advice should be one of the first steps of their procedure. That said, the police do have a duty to investigate any allegation promptly so it may mean that the breath test procedure will not be delayed whilst you seek legal advice. The issue can often be a complicated one however and there are some situations where lack of legal advice can be hugely significant in a case. The primary reason motorists come to Duncan Lewis Motor Law if they need a motor lawyer is because they want to keep hold of their licence for as long as possible. It is therefore unsurprising that when a motorist wants to plead not guilty and take their case to trial, they are concerned about any immediate implications of that. In short, you can continue driving for as long as your case is ongoing (right up until if/when you lose your licence at a sentencing hearing) unless the court makes an order to the contrary. The court do have the power to impose interim disqualifications whilst a case is pending but this would usually only be implemented against drivers who pose an immediate danger to the public. For many of our clients, driving is part of their employment and how they earn a living so it is comforting to know that they can continue to work throughout the duration of their case. There are some types of court proceedings where representing yourself is truly a viable option and there are some instances within road traffic law where hearings do not require specialist representation. Totting cases where you are at risk of a 6 months disqualification. These cases (particularly those involving alcohol/drugs, dangerous driving or cases involving a fatality) are not only extremely complex areas of law but also carry significant penalties that can be life altering in some cases. There is often an assumption that the court’s will be more lenient on those who are unrepresented but unfortunately this is quite simply not true. The courts are there to not only ensure justice but also that the law is implemented correctly. This includes making sure that the almost limitless amount of rules and regulations are followed and without the necessary legal training you will soon find yourself in over your head- especially when you consider that across from you in court will be a fully trained and experienced Prosecutor whose sole job is to convict you! Legal Professionals have quite literally studied for years and been subject to close guidance/supervision by qualified professionals before they are able to perform their role effectively and navigate the court process. They are required to continually refine and develop their knowledge and experience in a profession that is ever changing and evolving. We do not advise you of this to frighten you- only to make sure you are aware of scale of what you may be trying to do. If you are thinking of representing yourself we would urge you to contact us before you commit to any decisions or proceedings as we may be able to help you with some free advice. We will also provide you with our honest opinion on whether or not yours is a case in which you could represent yourself and still have a chance at a successful outcome. If the costs of private representation are too expensive then we would recommend that you examine any insurance policies you pay for to check for any legal expenses cover that may be included. Legal Expenses cover is most regularly offered with car or home insurance but we recommend checking any insurance you have! It’s almost a natural assumption to think that there is no way around a conviction if you are charged with an offence. On the whole, we as the general public put a lot of trust into the police so if they say we’ve committed a crime- surely we must be guilty? When a lawyer then advises you to the contrary, caution kicks in and people find themselves in a position where they are not quite sure who to trust- the police or the lawyer. This often prompts the question: Will I make things worse for myself if I try to defence the case? The question touches upon the credit system which operates at court and big changes came into effect on 01 June 2017. On the whole, the credit system does not have any meaningful impact on offences that carry a mandatory disqualification as the duration of the sentence is always pre-determined. There may be financial implications that we would explain to you. That said, the topic of “credit” is an interesting one and gives an insight into how the courts operate. In a nutshell, the court can grant a reduction on the prospective penalty should you as the defendant pleads guilty early on in the proceedings. The whole concept has been quite controversial since its introduction as it was viewed by some as swaying defendants to plead guilty to offences they may not have committed and the opposite view was that it was allowing criminals to “get off easy”. The reality is that the government introduced the system to help reduce the impact an offender may have upon the public purse by taking their case to trial funded by legal aid. Advising on credit has been a fundamental part of a lawyer’s job which many clients find a little perplexing. Why is the person who is “on their side” already talking about rolling over to accept a more lenient penalty? Of more concern to clients was when judges started to ask questions about advice given relating to credit in open court as part of “active case management”. In many cases a judge would go so far as to express their own view on a case at the first hearing without having had sight of any evidence in the case. Unfortunately this happens all too often to defendant’s charged with drink driving or drug driving or a similar offence that is largely viewed as indefensible as many judges wish to encourage a plea of guilt as soon as possible. This often leads to our clients wondering why the judge is questioning us and criticising the defence being raised. The relationship between a lawyer and client requires a lot of trust and causing defendants to wonder whether their representatives know what they’re doing is not helpful. It is almost comical that defendants are asked about their not guilty plea sometimes five times before a case gets near to trial. 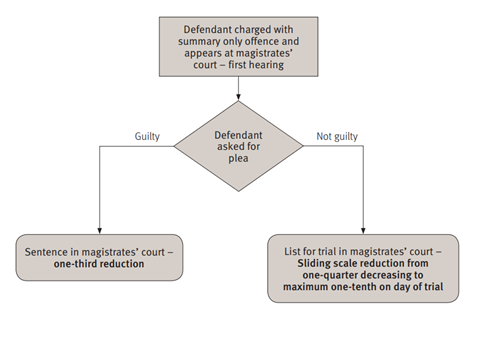 Historically, a judge has been able to allow one-third reduction for a guilty plea at the first opportunity which is usually the Plea and Case Management Hearing (PCMH). This is usually when you will first appear in court. If you change your plea to guilty between the PCMH and the trial then they can still allow one-tenth of credit. It has not been unheard of however for a judge to offer a full third on the DAY of trial which really tests a defendant’s resolve at the very last minute: “This is your LAST CHANCE to get this fantastic, one-time only deal on your punishment!” This has often resulted in trials “cracking” which results in all the preparation and costs incurred to that point effectively being a waste of everybody’s time and resources. Some judges have even gone so far as to reduce credit immediately from one-third at the very first hearing if, in their view, the evidence against the defendant is overwhelming. This is before a lot of the evidence is even available! In short, there has been considerable inconsistency around the country and even within the same courthouse and the guidelines have needed firm clarification on how the scheme should be implemented in court’s across the country. The new guidelines that came into effect on 01 June 2017 may be seen by many as less of a clarification and more like an additional way to apply pressure on a defendant to plead guilty before even knowing the full case against them. Indicate a guilty plea before the matter is passed to the Crown court in indictable offences. We are required, and will always strive to act in your best interests. We will s advise you in respect of credit and this advice will vary depending on the allegation. I cannot help but think that the guidelines as they currently stand are inescapably pro-prosecution. The courts are putting pressure on defendant’s to plead guilty without knowing the full facts or strength of the case against them. The initial details of the prosecution case (IDPC) is a bundle of disclosure that was intended to be available at the first hearing for review. Since its introduction however the IDPC has been painfully lacking in our cases and rarely include more than a charge sheet and case summary (the latter having no evidential value). CCTV, statements from officers and details of sample analysis which are often crucial to our cases are always missing from the IDPC and this makes giving our clients the level of advice the court demand that we do is nigh-on impossible. Serve expert reports promptly (before questioning why we need them and refusing to list trials on dates they can attend. Unfortunately it seems that it’s only the defendants who “delay justice” and our good government thinks that they should all just plead guilty! ADVISORY NOTE : Our specialist motor law team does not accept cases that are legally aided due to the restrictions a publicly funded case carries with it. Due to the specialist nature of motor law there are typically expert witnesses and barristers that need to be instructed to help ensure a successful result. The experts and barrister we use (who are widely regarded as the leading experts in their field) do not take cases that are legally aided. Not being able to instruct the right expert or barrister seriously reduces your chance of success and we would strongly recommend that you pay for your case privately or via an insurance policy if possible. If you cannot fund your case privately we would refer you to our general crime team for advice. Being charged with a criminal offence is worrying enough but the potential cost of defending yourself can be an even more daunting prospect. Legal Aid is widely available in a range of different areas of law and it is in place to help you meet the costs of legal advice, family mediation and representation in a court or at a tribunal. You cannot afford the costs yourself. When it comes to motor law however the criteria is slightly more strict due to the volume of motorists claiming legal aid cost the public purse millions of pounds a year. There are two tests that the court applies before granting legal aid; the financial means test and the interests of justice test. A means test will be carried out that examines your gross annual income and will also take into account your personal family circumstances. In its simplest terms: if you are on a low income below the lowest threshold you will pass the financial means test. The test looks at the income of relatives and other sources in addition to your own so it is not always safe to assume you as an individual will pass the means test because you have a low income. If you have an income above the maximum threshold you will fail and not qualify for legal aid. If your income is in-between the lowest threshold and the highest threshold a more detailed means test will be carried out to determine your eligibility. A full means test will examine your finances more closely to determine your disposable income and assess your ability to pay. If you are on state benefits it is likely you will pass the financial means test and may automatically qualify for legal aid. Passing the means test is the first step in qualifying for legal aid. The second step is…. As a general rule for motor law cases, if you do not satisfy the first criteria under the Interests of justice test it will make securing legal aid much more difficult. The safest amount of drinks you can have before driving is zero but the reality is that the majority of motorists have an idea of how many drinks they can have before driving to remain under the limit. The difficulty with this question is that some motorists think they have their own personal limits that may be more than the average Joe. In some cases this may be true (everybody deals with alcohol differently) but there is a huge difference between a motorist feeling OK to dive and actually being OK to drive. We are often asked how many drinks someone can have before driving both from potential clients and our own friends and family. The truth is that it is a very difficult question to answer with any certainty. Every individual processes differently depending on their age, gender, height, weight and individual metabolism. One person may have two pints and be absolutely fine whereas someone else might have the same amount to drink but find themselves over the limit. The internet is filled with websites that offer to calculate your alcohol level and there is also an array of apps offering to help you stay safe. Whilst these may be good as an indicator, they should never be taken as 100% accurate due to the amount of variables involved. To our knowledge, there is no app or website out there that can guarantee they can precisely calculate your alcohol level. Different drinks obviously contain different levels of alcohol and the size of the drink and the strength of the alcohol are also important factors. A guide (taken from the NHS website) is to your right so you can see what your typical drinks contain in terms of units. Each unit roughly equates to 10µg of alcohol and you should make sure you are aware of the legal limits . ..then the answer is yes. The above are all offences that carry “obligatory disqualifications” under section 34 of the Road Traffic Offenders Act 1988 meaning that a minimum disqualification of 12 months must be imposed. This is regardless of your personal circumstances. The only way to avoid a disqualification is by successfully defending your case (which is exactly what we specialise in) or if Special Reasons apply. If you have been charged with any of these offences we would strongly urge you to contact us to see if there is a way you can keep your licence. How far over the limit you were. If this is your first offence then the starting point is determined solely on your alcohol level. If you have a previous conviction within the past 10 years however then the court must impose a disqualification of at least 3 years in accordance with s.34(3) of the Offenders Act. If you have an offence within the last 3 years however then the sentence can be much more serious as the court are able to then consider a custodial penalty. With no previous convictions, the court takes your alcohol level and refers to the sentencing guidelines. Many motorists mistakenly assume that drink driving will always attract a 12 months ban but this is not the case. If your breath reading is 65 for example then the you will face a disqualification between 17 and 22 months (17 months being the starting point before the court consider aggravating factors which can increase the duration to 22 months). In most cases, the DVLA will write to you towards the end of your disqualification with information on how you get your licence back (usually just filling out a form). If you are considered a high risk offender however (as you would be after a dangerous driving case) then the court can order you to take an extended reset before you can regain your licence. Many motorists erroneously assume that if they are charged with drink driving they have the right to provide a blood sample if they are not comfortable with the breath test result however this is not, and never really has been the case. Historically, there was what was called the “statutory option” afforded by section 8 of the Road Traffic Act 1988. The statutory option was introduced at approximately the same time as evidential breath testing in the 1980’s and was to alleviate any doubts as to the accuracy of evidential breath testing machines. In the event that a defendant’s breath sample was below 50µg of alcohol per 100ml of breath, this section allowed the suspect to opt for a second sample to be taken which would be of blood or urine. In these circumstances the breath test results would be disregarded and the prosecution could only use the results of the subsequent test as part of their case. The logic behind this option was that a breath result is only ever an indication of a suspect’s blood alcohol level as it is illegal to have too much alcohol in your blood (that is what makes out the actual offence of drink driving). If a breath result was over 50 then it was safe to assume that the suspect would be over the blood/alcohol limit however this is not the case if the result is lower than 50. It would be explained to the suspect that because the breath test was lower than 50 they had to make a decision on whether to rely on that result and move forward on that basis or give another sample. The benefit of this was that a blood or urine sample (which is more accurate) could prove that you were actually under the limit and you would not be charged. The risk however is that the blood result could show you to be even more over the limit than the breath result indicated and may have an impact on sentencing. Whilst this helped avoid suspects being wrongly charged, it also increased the costs to the public purse as having the blood samples analysed cost a considerable sum each year. The “safety net” afforded by the statutory option was removed in 2015 after the Deregulation Act received Royal Assent on 26 March 2015. This meant that suspects could no longer opt to provide an alternative sample. When Should You be Asked to Give Blood? Despite the option no longer being available there are still some circumstances under which a suspect may provide a sample of blood or urine; most commonly when they are unable to provide breath. If a suspect fails to provide a breath test, the officer must use some common sense/discretion and consider why the breathalyser cannot be satisfied. If the machine produces error messages or the officer suspects that the device is not functioning correctly then a sample of blood or urine can be required(the different terminology is significant as it is no longer an “option”). Similarly, if the officer suspects that the suspect cannot provide a breath sample due to a medical reason then an alternative sample can be required and failing to provide said sample is a separate offence entirely.